Are you or the family doing some back-to-school shopping for computers this year on a tight budget? 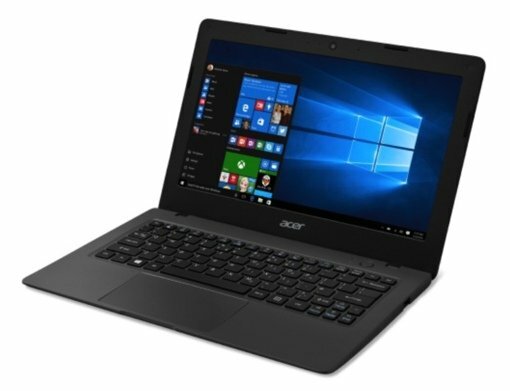 If so, check out the latest bargain-priced Windows 10 laptops from Acer, the Aspire One Cloudbook 11 and 14. Both are capable machines for basic school computing tasks starting at just $169 for the 11-inch model. Because these laptops are made with keeping the price as low as possible, there aren’t a lot of frills to the Acer Aspire One Cloudbooks. Each comes with a basic 1.6 GHz Celeron processor, 2GB of RAM, a 480p webcam for conferencing and just 16 GB of built-in storage. Both laptops come with a year-long subscription to Office 365 Personal and 1TB of OneDrive cloud storage space, too. Naturally, the Aspire One Cloudbook isn’t for gaming, video editing and other heavy-duty computing tasks. But you can use the Internet-connected device to surf the web, write email, watch video, compose reports and get homework done. In this way, the Cloudbook works a lot like HP’s Stream 11 Windows Laptop (now $179.99 on Amazon) – both are minimalist, inexpensive devices that rely on the cloud for data storage. If you’re interested in the new Acer Aspire One Cloudbook, you’ll want to keep an eye on store shelves. The 11-inch Cloudbook 11 launches this August with a price of $169; the 14-inch Cloudbook 14 launches in September with a $199 price tag. I read this article completely. I read this article completely. I collect many information from <it href=”http://www.techtipsyard.com/”> it </it> .